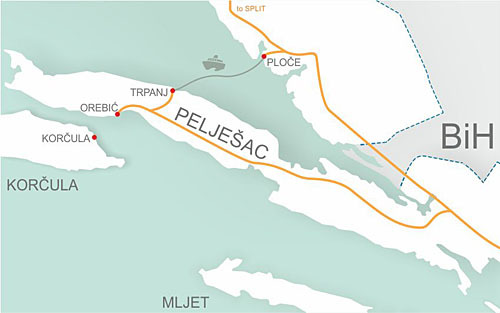 This car ferry line connects port Ploče on the mainland and port Trpanj on Pelješac peninsula. If you are arriving to Dubrovnik from the north and want to avoid crossing the Bosnian border you might consider taking this ferry. The same applies if you are traveling to, or just want to make a short stop, on Korčula Island. The journey from Ploče to Trpanj is 1 hour long. The Ploče-Trpanj car ferry is run by Jadrolinija, the major Croatian ferry company. Tickets can not be bought online. We recommend that you arrive at the port at least 30 minutes (1 hour is even better) in advance, buy your ticket at a small Jadrolinija kiosk and put your car in the waiting line. If you want to avoid crossing a Bosnian border in order to get to Dubrovnik, Orebić, or Korčula use this 1 hour ferry connection. There are many amazing sightseeing possibilities in this area, why not rent a car and explore Pelješac peninsula along the way. Where do I buy ferry tickets for the car ferry from Ploče to Trpanj ? Ferry tickets can be bought at the kiosk in Ploče or Trpanj harbour, usually one hour before departure. During summer we recommend that you arrive some time before and put your car in line to ensure a place on the ferry. Tickets can also be bought at the main Jadrolinija office in Dubrovnik. Consider that during summer there could be heavier traffic on the road so plan your trip leaving some time margin for you arrival at the ferry port. Korčula, also called "small Dubrovnik" is definitely worth a visit. Save some time by not having to drive along Pelješac peninsula again. Go from Dubrovnik to Orebić, take the ferry to Korčula, upon return from Korčula to Orebić a short drive (22 kilometers) will take you to Trpanj, from where you can take the ferry to Ploče and continue towards Split.